We’re pleased to announce that HTTP/2 is now in General Availability (GA). Our team has been working diligently to tightly integrate HTTP/2 support into our existing environment. We’ve taken measures to ensure that our design and testing of this component adheres to the HTTP/2 protocol standards and can be seamlessly deployed across our entire network. Customers on our shared as well as dedicated and hosted certificates have the option to use HTTP/2 right away. All new customers and certificate entries will be HTTP/2 enabled by default. To enable HTTP/2 for your Shared SAN certificate, you can perform a quick CNAME record update. Our existing HTTP/1.1-only CNAMEs use a naming format of [single letter].ssl.fastly.net. With HTTP/2, we now have new CNAME records that use a format of [single letter].shared.global.fastly.net (for our global network) and [single letter].shared.us-eu.fastly.net (for our US / EU Network). Simply add the Certificate Letter to the appropriate CNAME to begin using HTTP/2. Remember that your existing maps, which will remain HTTP/1.1 only, will not be going away anytime soon – you can test HTTP/2 at your own convenience. Your maps are ready to use immediately. To enable HTTP/2 for your account, just let us know via a support ticket that you’re ready for HTTP/2 and we’ll modify your certificate so it becomes HTTP/2 by default. If you use our Anycast IP addresses for Apex domains and are interested in HTTP/2, please let us know via a support ticket, and we’ll provide HTTP/2-enabled Anycast IP addresses for your use. 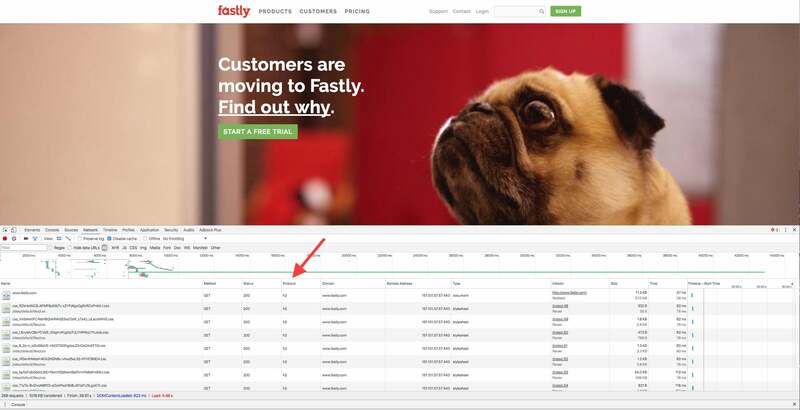 Claiming a name in *.global.ssl.fastly.net makes the name also available via HTTP/2 in *.freetls.fastly.net. Customers can use URLs with both names to take advantage of HTTP/1 and HTTP/2 during the transition before all traffic will be switched to HTTP/2. Note: the current domain that’s listed in your service configuration can be found here with a nomenclature of *.global.ssl.fastly.net. For example, jevans2.global.ssl.fastly.net already exists in my configuration and I want to take advantage of HTTP/2. Again, I don’t change anything in my configuration, I simply update my host domain to use jevans2.freetls.fastly.net and voila, HTTP/2 works! My existing jevans2.global.ssl.fastly.net domain is also still available for use (though it only supports HTTP/1.1). Follow our documentation found here and continue using the *.global.ssl.fasly.net naming convention when you create your domain. Note: the canonical *.global.ssl.fastly.net domains will be converted to support HTTP/2 later in 2017. A handful of new and useful VCL variables for HTTP/2 and TLS, which will allow customers to identify HTTP/2 requests, stream IDs, whether the request was pushed, the TLS cipher suite, and more. Single connection with multiplexed streams: your browser will now use a single TCP connection with multiplexed streams — instead of using techniques such as domain sharding which opens up multiple connections (thus incurring more TCP overhead) and forcing the browser to wait for requests to finish, browsers can now fetch all assets concurrently, over a single connection. HTTP/2 also eliminates head-of-line blocking through interleaving and out-of-order delivery. HPACK Compression: for pages with large headers (like some cookies, for instance), HTTP/2 Header Compression will decrease bandwidth due to header size. Server Push: HTTP/2 also introduces Server Push functionality, which allows servers to preemptively send assets to a client before the client requests them, accelerating the delivery of essential resources to the browser. We’ll dig into Server Push in a future blog post – stay tuned. You can also navigate to chrome://net-internals/#http2 to see more details about existing HTTP/2 connections. 192.168.124.24, www.example.com, /index, 1, 0, 13, "ECDHE-RSA-AES128-GCM-SHA256"